In this Tyrael Build Guide, we provide an overview of his strengths, abilities, talents and matchups. Tyrael is a powerful warrior that's capable of hard-pushing a lane when surrounded by his team. With the combination of his speed, mobility and ability to bolster his team mates, he's incredibly strong in the right hands. Unlike Muradin or Johanna, he is arguably squishier, despite having a shield. However, he makes up for this in the fact he can get in and out of fights quickly and in the process, can harrass deep into an enemies team before coming back to shield his team. With the two warrior meta, Tyrael works well and compliments most compositions but does require a skilled player. Although I'd argue there are better choices right now, he can still carry fairly hard in the right hands and is still exceptional at diving the back-line. Archangel’s Wrath (Trait) – While you can deal a fair amount of damage with your Trait, you should be tanky enough that you’re not dying often, which means you won’t have a lot of chances to make use of it. Combined with the fact that you don’t get any added mobility during these 3.5 seconds, it can be difficult to position yourself well to make use of it. However, if you are able to land the damage on multiple targets in a fight, it can be quite effective. At the very least you should ensure you tag at least one player with the detonation to trade for your death. El'Druin’s Might (Q) – This is your main source of both engage and escape, depending on the situation. Tyrael wants to be right at the front of the fight, and this will allow him to do just that while also slowing enemies around him. Once the blade is thrown, the range from which you can teleport to it is unlimited, so use that to your advantage by baiting out abilities/CC then teleporting. If you can, only try to engage with your Angelic Flash if you know you can make it out alive. If you can't you'll be far too deep and die incredibly quickly. Righteousness (W) – This is what makes Tyrael such an effective "tank", and offers a lot of late-game pushing power. A shield for your nearby allies can be invaluable in fights, and makes you hard to take down. Be aware that Righteousness only lasts for 4 seconds so it's incredibly important not to use it too early. If you do, it'll vanish and will still go on cooldown. Smite (E) – Smite is your main source of poke damage as it has the lowest cooldown of your abilities. It offers a nice boost of mobility to both yourself and your allies, allowing your team to dart around a team fight as you continue to lay down Smites. The main thing to be aware of is the fact that if you use Smite too early, you and your team will be without an escape. Try to time it so you can escape easily, or engage quickly. If possible, it's also worth placing in a location that ensures as many of your team as possible receive the speed bonus. Judgment (R) – This Heroic can be extremely potent when used at the right time. You can catch an opponent who’s out of position for your team to single out and kill, lock down a priority target in a team fight, or interrupt an important channel. Unfortunately this ability can be easily wasted, so make sure you’re choosing your target carefully. It's also worth noting that if you do dive in, your team has to follow up otherwise you're going to die very quickly. Not only that, but if you dive away from you're team who's there to protect them? Be sure to have a second warrior if you pickup Judgment. Sanctification (R) – Choosing this Heroic means you’re sacrificing damage and a stun for complete invulnerability in an area. Deciding between Judgment and Sanctification will often come down to both team composition and the Battleground you’re playing on. Sanctification has generally been considered the superior choice simply because of the AOE immunity it provides to you and your team. In the right situation, making all (or most) of your team immune during a team fight can be game-changing especially against a wombo-combo from the enemy team. Key to using Sanctification however is knowing when to cast it; too early and it's wasted. Too late and your team will have suffered too much damage. 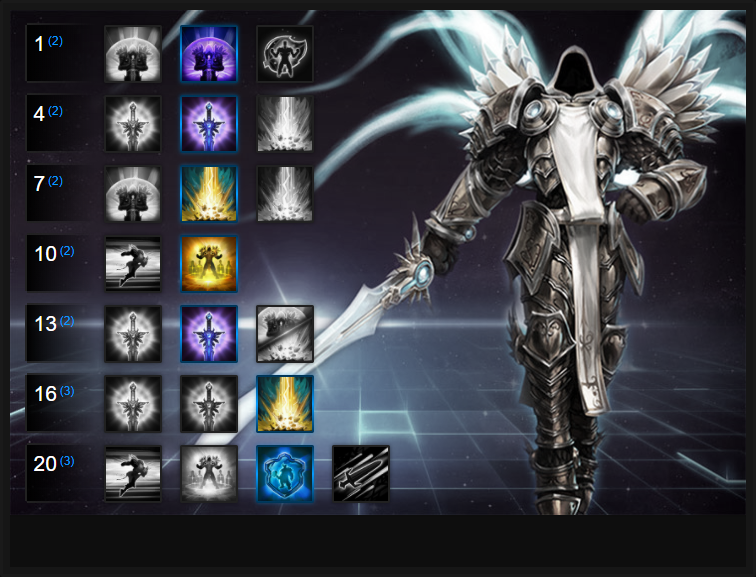 Like our Tyrael build guide? You can help support its updates by subscribing to Ten Ton Hammer. Here's the details. By default Tyrael's shield only affords his allies 40% of its value. Justice For All increases this to 100% for everyone, ensuring those around Tyrael gain all of its value. For survivability in a team fight, that's amazing for him and his team. Tyrael has no real crowd control outside of a minor slow from El'druin's Might, so taking Bound By Law is very good for him. Not only does it increase the slow by 10% (from 25%) but also allows Tyrael to extend the duration by 1 second, up to 4 every time he lands a basic attack. Considering you'll often immediately teleport onto an enemy, maintaining the slow is fairly easy (and very potent). Building on the fact you now slow players by 45% after using El'druin's Might (as long as you hit them with basic attacks), Purge Evil bolsters you even more. Smite now allows Tyrael to gain a 35% bonus to his basic attack damage for each Hero hit by it. After using Smite once you've teleported, it's possible to deal massive melee damage. The immunity Santification provides is unrivalled and it can comfortably ensure your team withstands any wombo-combo the enemy team throws at you. Timed correctly, it can mitigate all incoming damage and effects for 3 seconds - you can then turn the tide and plough through your opponents. Variable: Judgement is, without a doubt, one of the best Heroic abilities in the game. Tyrael will charge forwards a fair distance, stun, deal damage and knockback enemies around him. It's an incredible initiator and even better when you've primed your shield before going in. If you do then take damage it'll explode and you can always use El'Druin's Might to quickly exit the fight. Better still, your team should be quickly backing you up for a quick wipe of the enemy. Always try to initiate on the squishiest and most dangerous target. Best used if you've a double warrior composition so your backline is always protected. Providing incredible area denial, Holy Ground leaves an unpassable ring around El'druins Might once you teleport to your sword. Whether you're preventing enemies reaching your team or ensuring they cannot escape through a door-way, it's a must have talent. Allowing Tyrael to reduce the cooldown of Smite by 125% when El'druin's Might is active, or after teleporting, Smite The Wicked ensures you constantly have Smite available, allowing you to move quickly, but also deal high basic attack damage during a team fight. Defence of the Angels offers incredible mitigation for Tyrael, allowing him to gain +40 armor for 5 seconds, reducing incoming damage by 40%. Better yet, when Righteous Shield absorbs damage, the cooldown of Defence of the Angels is lowered by 3 seconds - regardless of source, or player. These Hero Threat Levels (1 being lowest threat and 10 being highest threat) are to help you determine which enemy Heroes can give you a headache. Any Heroes that aren't on this list are easy pickings for Tyrael. If a Hero is listed here, take greater care. Johanna: Her survivability combined with her slow, pull and ultimate stun make her really difficult for Tyrael to deal with. She's a good counter but she won't kill you in a hurry. Brightwing: Although he's never going to kill you, Brightwing is particularly strong against Tyrael due to her ability to Polymorph you and make your ultimate redundant. The Butcher: His charge, Lamb to the Slaughter or self heal can rip you up in seconds. Even if you shield yourself, you're still going to take a huge amount of damage. This list of tips and tricks are just a handful of things we think will help your Tyrael play. We'll continue to add to the list as required and if you have any tips you'd like to share, let us know in the comments below and we'll place them here. 1. All your abilities can apply to minions, as such you should always be winning a lane push whether solo or with your team. Your shield and speed boost make your minions much stronger than the opposition - use it to your advantage. 2. Smite is pretty cheap on mana, as such you should poke your lane opponent regularly with it. 3. El'druin's Might is a powerful offensive and defensive ability. You can use it to quickly engage and force a fight or you can flee quickly thanks to the teleport. Similarly to Sylvanus and her Haunting Wave, be clever when using it. It's a good idea to throw it in one direction, run another and then teleport away for a clean escape. 4. Try to always use your shield around your team mates and the moment you engage a fight. It only lasts 4 seconds so make it count. 5. Smite makes your allies run 25% faster when they move through it. Ensure you place this in front of your team if they're chasing an enemy or trying to escape. 6. Judgement > Righteousness > El'Druin's Might > Smite is a high AOE spike that will pressure even the hardiest of teams. If you can, try to complete this rotation against a squishy target and ping the enemy beforehand so your team know who to attack. 7. Remember that when you die you'll be able to navigate Tyrael to then explode. The damage is significant and will finish anyone off that's low health. Aim for vulnerable Heroes such as Jaina or Kael. 8. Try to time Santification for when you anticipate lots of damage is coming. Your team will mitigate it all and be able to retaliate easily. 9. Most of the time you can teleport into combat with your sword and escape easily if you have Smite and Righteousness - don't be afraid to bully. 10. Be very contious of over-extending as Tyrael. Diving too deep will leave your backline exposed and you'll be unable to get back quickly enough to help. Thanks for reading our Tyrael build guide. You can help support its updates by subscribing to Ten Ton Hammer. Here's the details.